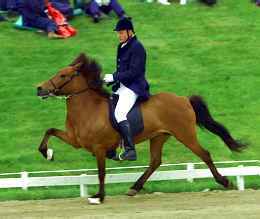 Von frá Bjarnanesi (7.94) is a four gaited competition mare with good gaits and spirit. Von has 9 for tölt and is daughter of the four gaited stallion Klerkur frá Bjarnanesi (8.15) and Embla frá Veðramóti. Von frá Bjarnanesi is very good four gaited competition mare with very good tölt. She is beautiful liver chestnut and has 7.94 for Conformation and 7.94 for Rideability; 9 for tölt, 8.5 for trot, spirit and general impression and 8.0 for gallop. Von has received 6.78 highest score for tölt and 8.40 highest score for Teenage Class. Von Competed in Young Adult Class at LM2012 and in Teenage Class at LM2016. 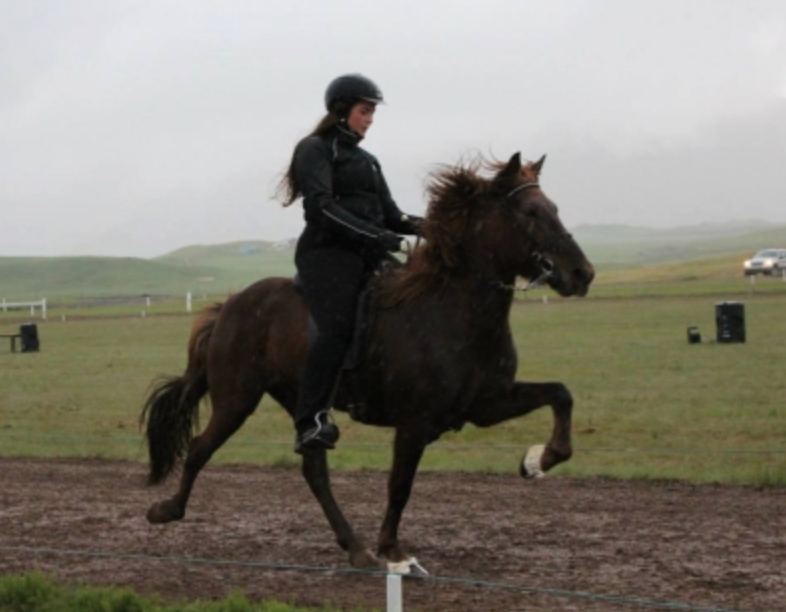 She is daughter of the four gaited stallion Klerkur frá Bjarnanesi (8.15) and Embla frá Veðramóti. 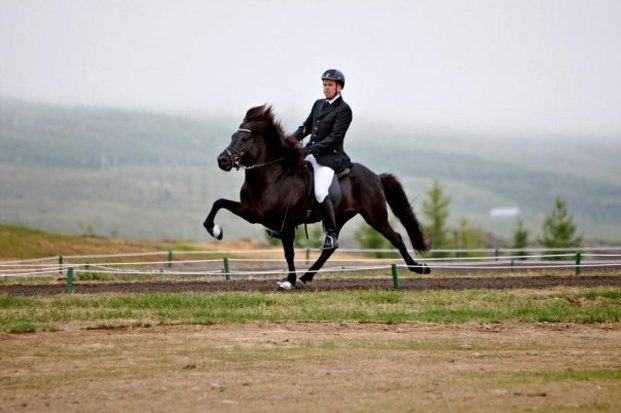 Klerkur frá Bjarnanes (8.15) is a great and beautiful black, four gaited stallion and a competition horse with 8.46 for Rideability; 9.5 for trot, 9 for tölt, gallop, spirit, general impression and walk. He has also 9 for slow tölt and canter. F: Glampi frá Vatnsleysu (8.35). 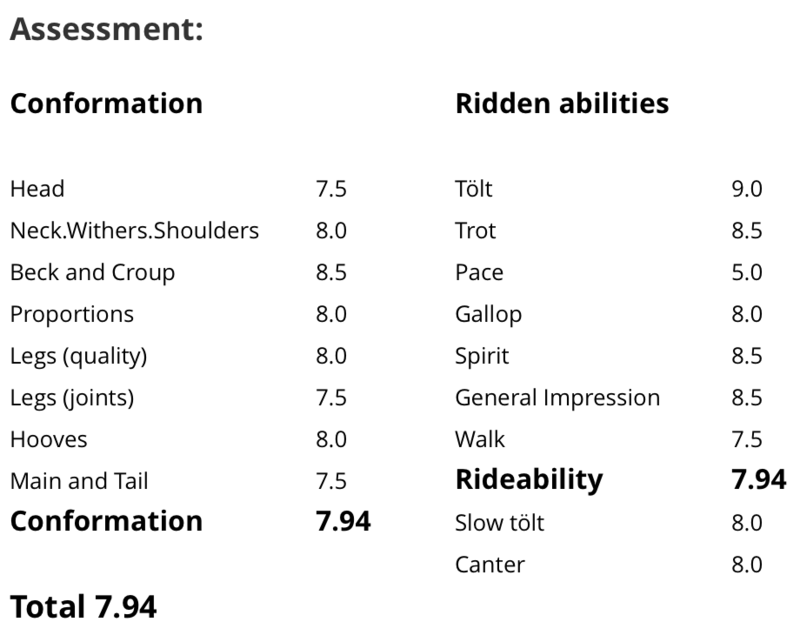 Glampi has 7.85 for Conformation and 8.68 for Rideability; 8.5 for tölt, 9 for trot, 8 for pace, 8.5 for gallop, 9 for spirit, 9 for general impression and 8.5 for walk. Glampi has also 7 for slow tölt and 8.5 for canter. He is jet black with blaze and white fetlocks and socks. Glampi got 1. price for his offspring at LM2006. FF: Smári frá Borgarhóli (8.01). Smári is a chestnut stallion with 7.73 for conformation and 8.30 for Rideability; 8 for tölt, 7.5 for trot, 9 for pace, 8 for gallop, 9 for temperament, 8.5 for character and 8 for general impression. 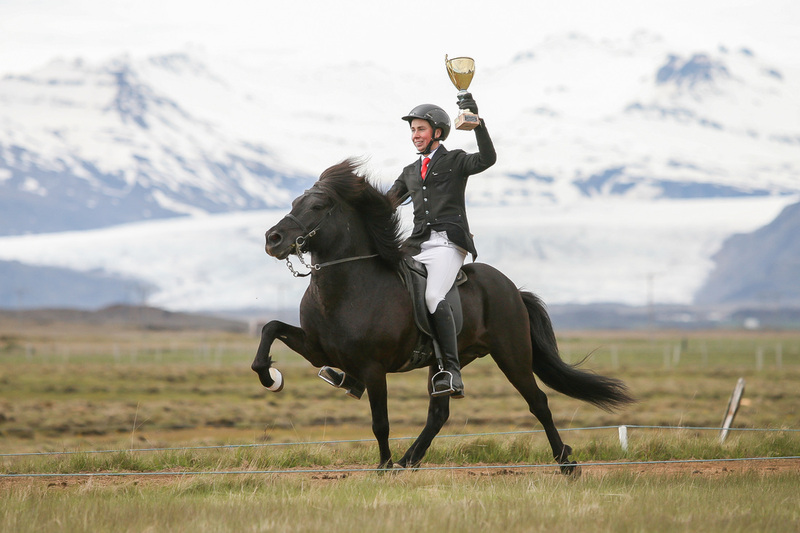 He is a son of the honoured stallion Hrafn frá Holtsmúla (8.56). FM: Albína frá Vatnsleysu (7.84). Albania was a four gaited mare with 7.98 for Conformation and 7.71 for Rideability; 8.5 for tölt, 8 for trot, gallop, temperament, character and general impression. Albína was black and partially glasseyed. M: Snælda frá Bjarnanesi (8.24), Snælda is a red bay, four gaited mare with 7.83 for Conformation and 8.51 for Rideability; 9 for tölt, 9.5 for trot, 9.5 for gallop, 9.5 for spirit, 8.5 for general impression and 8.5 for walk. Snælda has also 9 for slow tölt. ​MF: Stormur frá Bjarnanesi. 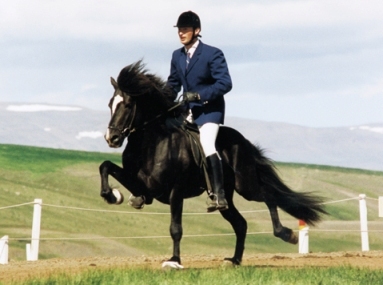 He was a son of the honoured stallion Snældu-Blesi frá Árgerði (8.19), (son of Hrafn frá Holtsmúla). MM: Gláma frá Eyrarhólum (7.64). A four gaited mare with 7.78 for Conformation and 7.51 for Rideability; 8 for tölt, 7.5 for trot, 8 for gallop, temperament, character and general impression. Gláma was bay with a blaze. Embla frá Veðramóti is a dark chestnut mare with white fetlocks. F: Leistur frá Álftagerði (8.30). 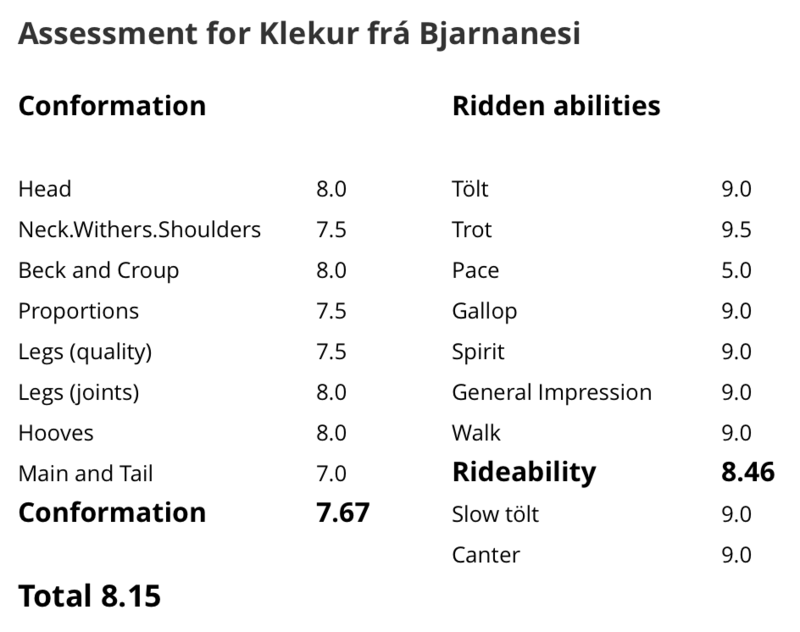 Leistur had 8.23 for Conformation and 8.38 for Rideability; 8.5 for tölt, 8 for trot, 8. for pace, 8 for gallop, 8.5 for temperament, 8.5 for character and 8.5 for general impression. Leistur was chestnut with a star and snip, and with white fetlocks and socks. FF: Fákur frá Akureyri (8.08). Fákur was bay with a star, he had 7.90 for Conformation and 8.25 for Rideability; 8.5 for tölt, 8 for trot, 8.5 for pace, 7.5 for gallop, 8 for temperament, 9 for character and 8 for general impression. Fákur got 1. price for his offspring at LM1982. FM: Elding frá Kýrholti (8.44). Ending was light chestnut; sorrel with a star. She had 8.30 for Conformation and 8.58 for Rideability; 8.5 for tölt, trot, pace and gallop, 9 for temperament, 8 for character and 9 for general impression. Elding got 1. price for her offspring in 1983. She was daughter of Hörður frá Kolkuósi (8.31). He got 1. price for his offspring at LM1966. M: Rauð frá Veðramóti. She was a chestnut mare. 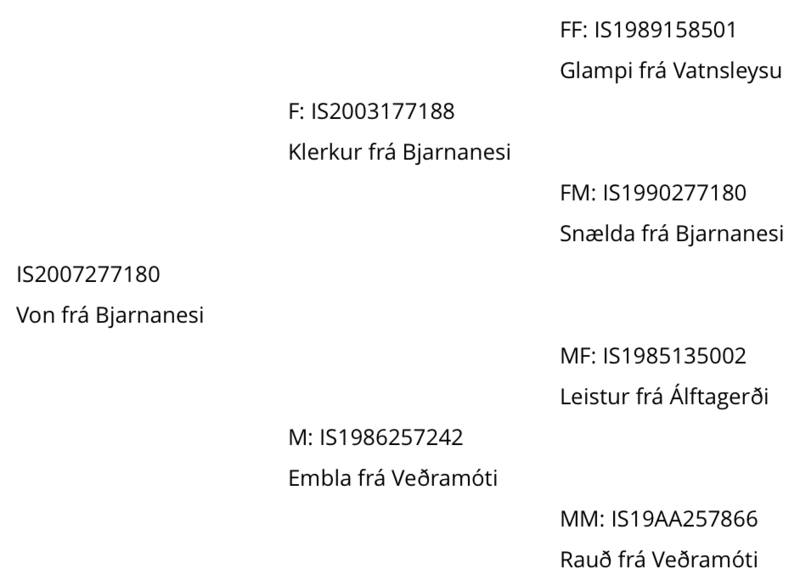 MF: Blossi frá Sauðárkróki (8.03). Blossi was a chestnut stallion with 8.00 for Conformation and 8.05 for Rideability; 7.5 for tölt, trot and pace, 8 for gallop, 8.5 for temperament, 9 for character and 8.5 for general impression. 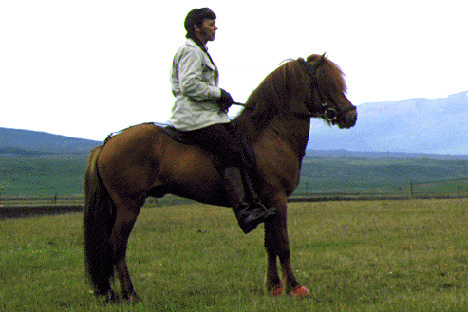 Blossi was son of the honoured stallion Sörli frá Sauðárkróki (8.24). ​MM: Fenja frá Sauðárkróki (8.06). Fenja was a chestnut mare with a blaze. She had 8.30 for Conformation and 7.82 for Rideability; 7.5 for tölt, 6.5 for trot, 8 for pace, 8.5 for gallop and temperament, 8 for character and 7.5 for general impression. Fenja got 2. price for her offspring in 1966.